If there’s a time of the year for a getaway, it’s now. Whether you’ve had a major vacay planned for months or are looking to take a spontaneous weekend trip, there’s no time like summer for a little escape. But just because you’re getting away from it all, that doesn’t mean you want your beauty and skincare routine to take a vacation too. So, with that in mind, today I’m sharing some of the best travel-friendly items to toss in your carry-on. When I pack for a trip, one of my main goals is to get more mileage out of fewer products. That means packing multi-use products like a tinted moisturizer with SPF in it and my favorite shade of Cheek Tint from Jouer, which can also be swept on the lips for a flush of color. I also carry the classic Rosebud Salve with me wherever I go. Talk about a major beauty staple. It doubles as a lip balm and a moisturizer for chapped skin, so there’s no need to carry a separate hand cream on the plane. And did I mention it’s only $6 for a tin that lasts forever? Toting around a ton of liquids can get messy, heavy, and might not meet TSA flight restrictions without transferring all your full-size products into smaller bottles. When I’m packing light, I like to make things easy by bringing along facial cleansing, nail polish remover, and even deodorant, all in the form of wipes. My usual face wash comes in wipes (Philosophy’s Purity Made Simple), and you might be surprised by how many others do too. I also love the Yes to Cucumbers Facial Towelettes for a natural (and very budget-friendly!) option. And if you don’t use them all on your trip, they also come in handy in your gym bag. If you’re flying, you have the harsh, dry airplane air to worry about. To avoid drying out your complexion, start by slathering on a thicker-than-usual moisturizer pre-flight. Whenever you’re in need of a little refresh, try a spritz of facial water spray in a convenient travel size. If you subscribe to a service like Birchbox or Glossybox that sends you sample-size products, save some of them in a separate makeup bag dedicated for travel. That way you will always have mini shampoos, conditioners, moisturizers, etc. on hand and won’t have to go out and buy them when you decide to take a trip. Or, if you have a favorite skincare brand whose products you all love, they may have a trial-size travel set that you can purchase, like these moisturizing must-haves from Yu-Be or this travel skincare arsenal from Scientific Organics. 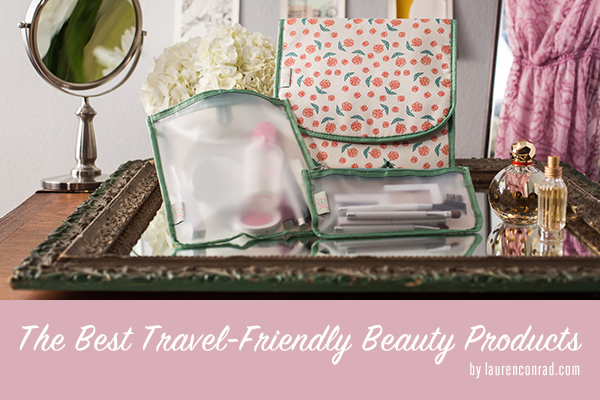 What do you pack in your cosmetics bag when you travel? Share your product picks in the comments!